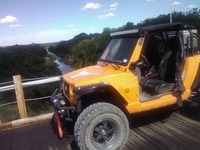 A little low water crossing at the Ranch near San Saba TX. 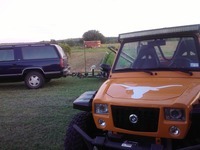 Riding the range with my uncle at my side. 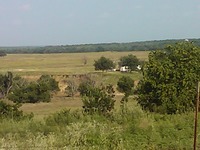 Rode the ranch again last weekend and its getting hot as, well you know. Dust is so bad it covered everything in and on the Reeper. 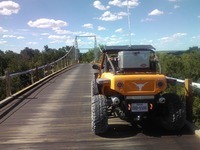 Some more ridding around the ranch and over the only county maintained suspension bridge in Texas. 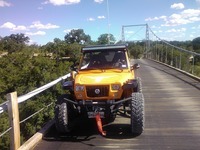 The Regency Bridge is about 80 foot over the Colorado River at this point with breath taking views. 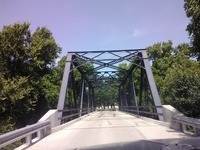 Waldrip bridge in Coleman County is not a suspension bridge only suspended by cables. A suspension bridge has to have two towers to hold the road bed up over the expansion. It is a cool old bridge tough. Also Waldrip is not open to everyday traffic as of right now. 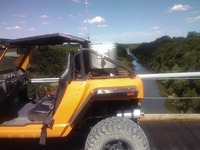 What about the Waldrip bridge in Coleman County. 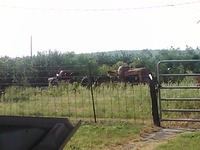 I understand it's also County maintained. Warren, we ask that you join the forum to continue posting. Thanks. 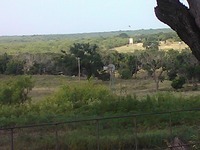 I have talk to a couple down that way and all they can talk about it the heat and lack of rain. One saying it was to hot to fish and they believed they were leaving the water to find shade anyhow. Fishing is bad right now anyway, someone dumped an old car in the river and every time you cast a line in they roll up the windows on you. That's so they can keep the cold water in.